France, the former slave power of west Africa, has poured into Mali with a vengeance in a military attack launched on January 11. French warplanes are bombing towns and cities across the vast swath of northern Mali, a territory measuring some one thousand kilometers from south to north and east to west. French soldiers in armoured columns have launched a ground offensive, beginning with towns in the south of the northern territory, some 300 km north and east of the Malian capital of Bamako. The invasion has received universal support from France’s imperialist allies. The U.S., Canada and Europe are assisting financially and with military transport. To provide a figleaf of African legitimacy, plans have been accelerated to introduce troops from eight regional countries to join the fighting (map here). The public relations version of the French et al invasion is a familiar refrain. “Islamic terrorists” and “jihadists” have taken control of northern Mali and are a threat to international security and to the well-being of the local population. Terrible atrocities against the local populace are alleged and given wide publicity by corporate media. Similar myths were peddled by the warmakers when they invaded Afghanistan in 2001 and Iraq in 2003. Off with a handshake into a C-17 transport plane, to support French imperialism. The uranium mines in neighbouring Niger and the uranium deposits in Mali are of particular interest to France, which generates 78 per cent of its electricity from nuclear energy. Niger’s uranium mines are highly polluting and deeply resented by the population, including among the semi-nomadic, Tuareg people who reside in the mining regions. The French company Areva is presently constructing in Imouraren, Niger what will become the second largest uranium mine in the world. Mali (population 15.5 million) is the third-largest gold producing country in Africa. Canada’s IAMGOLD operates two mines there (and a third in nearby Burkina Faso). Many other Canadian and foreign investors are present. A key player in the unfolding war is Algeria. The government there is anxious to prove its loyalty to imperialism. Its lengthy border with northern Mali is a key zone for the “pacification” of northern Mali upon which France and its allies are embarked. Further proof of the hypocrisy of the ‘democracy’ that France claims to be fighting for in Mali is found in the nature of the Mali regime with which it is allied. Often presented in mainstream media as a ‘beacon of democracy’ in west Africa, the Mali government was little more than a corrupt and pliant neo-colonial regime before last year when the U.S.-trained and equipped Mali army twice overthrew it – in March and again in December. The Mali army now scrambling to fight alongside its French big brother was condemned and boycotted by the U.S., Europe and Canada during a brief, sham interlude of concern following the first coup. Today, the Mali government is a shell of a regime that rules at the behest of the Mali military, the latter’s foreign trainers, and the foreign mining companies that provide much of its revenue. At the political heart of the conflict in Mali is the decades-long struggle of the Tuareg, a semi-nomadic people numbering some 1.2 million. Their language is part of the Berber language group. Their historic homeland includes much of Niger and northern Mali and smaller parts of Nigeria, Burkina Faso, Algeria and Libya. They call themselves Kel Tamasheq (speakers of the Tamasheq language). The Tuareg have fought a succession of rebellions in the 20th century against the borders imposed by colonialism and then defended by post-independence, neo-colonial regimes. They are one of many minority nationalities in west Africa fighting for national self-determination, including the Sahwari of Western Sahara, a region controlled by Morocco and whose Sahwari leadership, the Polisario Front, is widely recognized internationally. The Tuareg were brutally subdued by colonial France at the outset of the 20th century. Following the independence of Mali and neighbouring countries in 1960, they continued to suffer discrimination. A first Tuareg Rebellion took place in 1962-64. A second, larger rebellion began in 1990 and won some autonomy from the Mali government that was elected in 1992 and re-elected in 1997. A third rebellion in Mali and Niger in 2007 won further political and territorial concessions, but these were constantly reneged. A Libya-brokered peace deal ended fighting in 2009. The Mali state and army constantly sought to retake what they had lost. Violence and even massacres against the Tuareg population pushed matters to a head in 2011. The army was defeated by the military forces of the National Movement for the Liberation of Azawad (NMLA) and on April 6, 2012, the MNLA declared an independent Azawad, as they call northern Mali and surrounding region. The Tuareg are one of several national groups within the disputed territory. The independence declaration proved premature and unsustainable. The MNLA was soon pushed aside by Islamist-inspired armed groups that oppose Tuareg self-determination and an independent state. The army, meanwhile, continued to harass and kill people. A group of 17 visiting Muslim clerics, for example, were massacred on September 22, 2012. According to unconfirmed reports, the MNLA has renounced the goal of an independent Azawad. 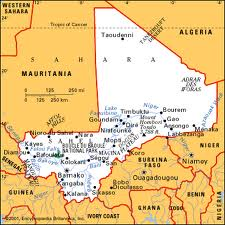 It entered into talks with the Mali regime in December for autonomy in the northern region. A January 13 statement on the group’s website acquiesces to the French intervention but says it should not allow troops of the Mali army to pass beyond the border demarcation line declared in April of last year. Mali is one of the poorest places on earth but has been drawn into the whirlwind of post-September, 2001 militarization led by the United States. U.S. armed forces have been training the Mali military for years. In 2005, the U.S. established the Trans-Sahara Counter-Terrorism Partnership comprising eleven ‘partner’ African countries-Algeria, Burkina Faso, Libya, Morocco, Tunisia, Chad, Mali, Mauritania, Niger, Nigeria and Senegal. Canadian troops have participated in military exercises in west Africa since at least 2008. In 2009, Mali was named one of six “countries of focus” in Africa for Canadian aid. Beginning that year, Canadian aid to Mali leaped to where it is now one of the largest country recipients of Canada aid funds. Only days into the French attack, evidence is mounting of significant civilian and military casualties. In the town of Douentza in central Mali, injured civilians can’t reach the local hospital, according to Médecins sans frontières (Doctors Without Borders). “Because of the bombardments and fighting, nobody is moving in the streets of Douentza and patients are not making it through to the hospital,” said a statement by the agency’s emergency response co-ordinator Rosa Crestani. The International Red Cross is reporting scores of civilian and military casualties in the towns coming under French attack. Amnesty International is worried. Its West Africa researcher, Salvatore Saguès, was in the country last September and saw the recruitment of children into the Mali army. He is worried about retaliatory attacks by the army if it retakes control of the towns and cities it has lost, notably in the northern cities of Gao, Kidal and Timbuktu. He also warned of the plans to bring neighbouring armies into northern Mali. “These armies, who are already committing serious violations in their countries, are most likely to do the same, or at least not behave in accordance to international law if they are in Mali,” he said. According to the U.N. refugee agency UNHCR, the latest crisis has internally displaced nearly 230,000 Malians. An additional 144,500 Malians were already refugees in neighbouring countries. UNHCR spokesperson Adrian Edwards says half the population of the town of Konna, some 5,000 people, sought as French bombs threatened to fall by fleeing across the River Niger. In an ominous sign of more civilian casualties to come, and echoing the excuses for atrocities by invading armies against civilians in Iraq, Afghanistan and Palestine in recent years, French military commanders are complaining of the difficulty in distinguishing fighters they are bombing from non-combatant populations. France’s army chief Edouard Guillaud told Reuters that France’s air strikes were being hampered because militants were using civilian populations as shields. The military attack in Mali was ordered by French President François Hollande, the winner of the 2012 election on behalf of the Socialist Party. His decision has been condemned by groups on the political left in France, including the Nouveau parti anticapitaliste and the Gauche anticapitaliste. The latter is a tendency with the Front de gauche (Left Front) that captured 11 per cent of the first-round presidential vote last year. His statement went on to complain that President Hollande did not bother to seek the approval of the National Assembly. Unlike the overthrow of Haiti’s elected government in 2004, which the PCF and Socialist Party supported at the time, France and its allies did not feel the need to obtain a rubber stamp of approval from the UN Security Council this time in Mali. But doing so would not have changed the predatory nature of this latest mission, just as it didn’t in Haiti. Roger Annis is an antiwar activist who lives in Vancouver, Canada.